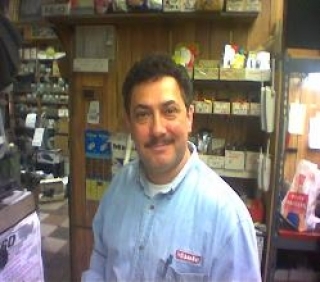 Broadway Vacuum is a third generation family owned and operated vacuum cleaner business. Opened in 1926 it occupied one of the two small stores located at 36-16 Broadway in Astoria Queens. In the eighty years since its beginning it has grown and expanded to occupy all 7000 sq feet and four levels of the building. Over the years we have added air conditioners, sewing machines, Floor Sanders, small appliances and electronics to our sales and service lines. Vacuum cleaners however remains our primary focus. In the last twenty years, our industry has seen an unprecedented increase in the number of manufacturers, lines and products available to consumers. The mom and pop vacuum stores across the country have had to face many pressures to survive. The globalization of manufacturing and the sluggish american economy have made it even more difficult for independent vac shops to hold on. Many of them unfortunately have been forced to close their doors forever. 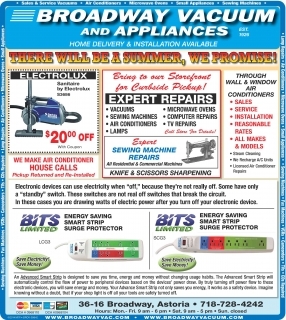 In order to continue to supply our loyal customers, expand our customer base and insure the future of Broadway Vacuum, we must once again expand our scope by bringing our store to the internet. 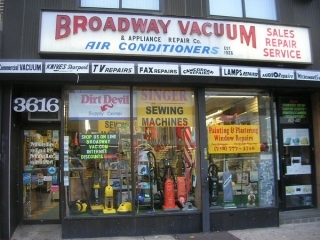 Together with the help of our suppliers, we hope to serve the needs of our customers 24/7 at Broadwayvacuum.com.